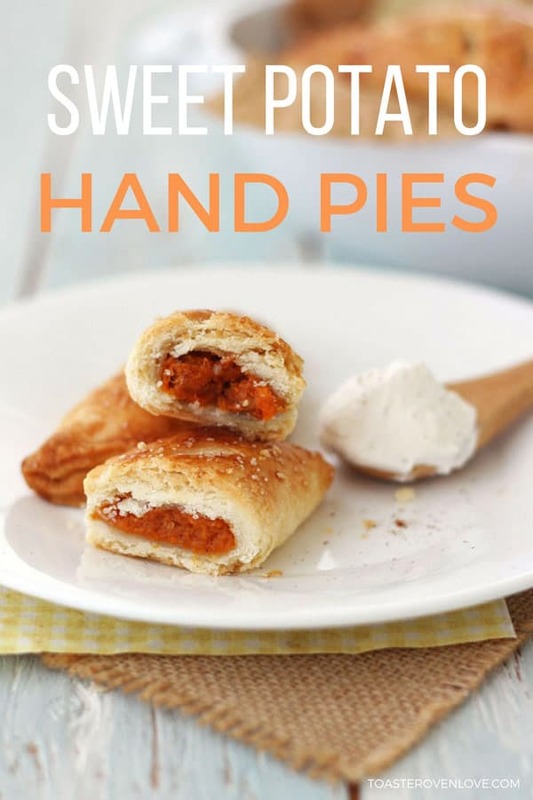 Whole pies are pretty great but mini sweet potato hand pies are sooooo much better. They’re basically, ALL the tasty flavors of a big ol’ slice of sweet potato pie in tiny individual portions. And you get to eat them with your hands! Making the filling is the perfect way to use up a leftover toaster oven baked sweet potato. Just scoop the flesh out and give it a good mash. Stir in a few spices, brown sugar (don’t be shy about adding more if you like your pies sweeter) and some chopped pecans too. 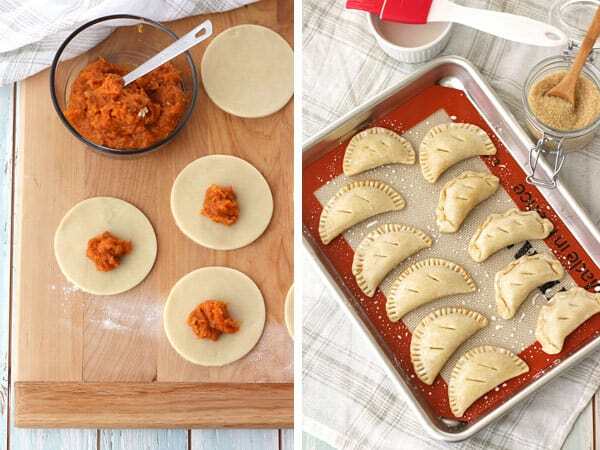 At our house, we’ve always made hand pies using store-bought dough so they’re ready in no time. And truthfully, my homemade pie dough skills are pretty weak. Is homemade pie dough your kryptonite too? Then the pre-made stuff is going to make you feel like a rock star. 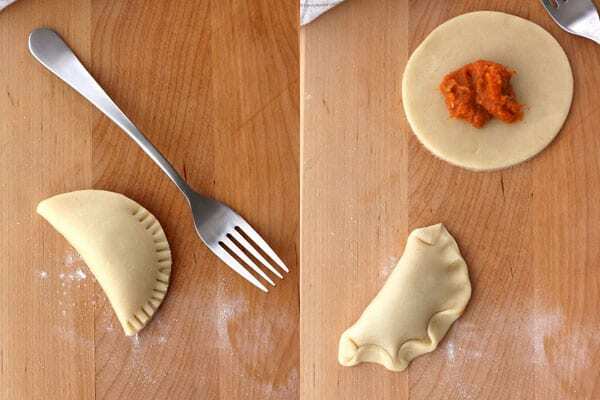 It’s buttery, flaky and hard to ruin. Next time I’d pay more attention to how thick the dough is rolled. The filling to dough ratio was a tiny bit off. The dough was a little more crumbly than flaky. That’s probably because it was over 90 degrees the day I baked them. If your house is really warm pop the pan in the fridge for 20 minutes to let the butter in the crust firm up before baking. Feeling adventurous I tried sealing the dough edges a few different ways. Pressing with a fork was easiest and did the best job so I’d just stick with it next time. Isn’t in the pie dough…It’s baking a single mini pie first! Just like when baking toaster oven cookies, baking a “test pie” is the easiest way to find the best cooking time and temperature for your specific toaster oven. 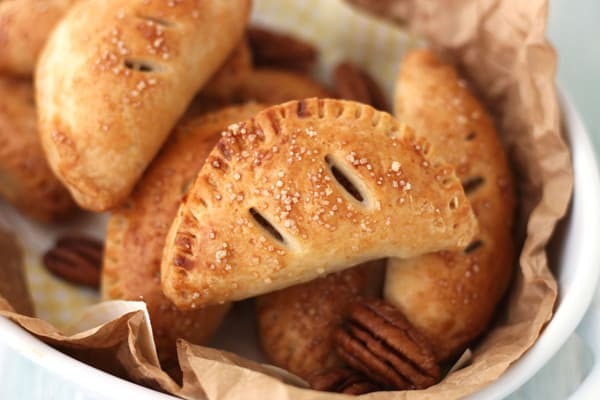 Then you can adjust the recipe based on your test, pop the remaining hand pies in to bake and rest easy that they’ll all turn out perfect. Pssst…I promise not to tell if you eat the already cooked one while you wait! And if you’ve been avoiding your toaster oven’s convection function this is a great recipe to start with. The convection will cook them a little faster and the crusts will be beautifully light and golden. 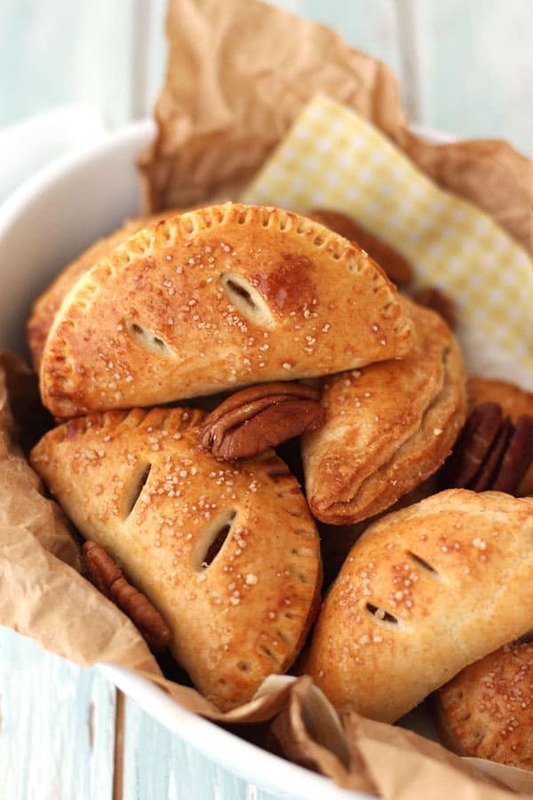 Along with a batch or two of sweet potato nachos, pumpkin spice cookies or addictive roasted sweet potato rounds these hand pies would be a fun addition to any holiday family gathering or office potluck. I can’t wait to make them with my nephew during the holidays. He’s going to love rolling out and filling the dough. While my sister will get to enjoy the lack of dirty dishes when we serve them! Oh, how pretty they are! And filled with sweet potatoes, they must be delicious!